Before we start looking at the Ring Theory, as mentioned at the end of the previous article, it is imperative for us to understand the conceptual foundation of the Quran. Fundamental characteristics need elucidation prior to moving on to a conceptual understanding of this Book. At this early juncture it seems necessary for me to emphasise that this article will be written for ease of reasoning (peppered with some unavoidable verbosity perhaps); therefore I will not intersperse it extensively with sources and origins of materials as for most of the part, the main source is M. M. Al-Azami’s “The History of the Quranic Text”. Only other sources would be named as it is referenced. Most Muslims would be able to tell you the following: that the Quran is a collection of Allah’s words as revealed to the Prophet Muhammad pbuh over the period of his prophethood spanning 23 years. The angel Jibreel acted as an intermediary between Allah and Muhammad pbuh, save for a few verses which were revealed directly to the Prophet during Isra’ Mi’raj. More often than not, at the time of revelation, the Prophet had companions with him who memorised the verses and wrote them down for the record. The Prophet would also indicate the order of the Surahs as they were revealed, culminating with the order of the whole Quran when Jibreel oversaw his recitation twice in the year of his death. The Quran started to appear in written form at the time of the Prophet pbuh, but only in fragments as scribes wrote them on various materials as it was revealed. Many would be familiar with the efforts of collecting the Quran as a whole volume firstly via the efforts of Abu Bakr ra at the insistence of Umar ra, appointing Zayd ibn Thabit ra as the main compiler, and culminating with the Mushaf Uthmaniyya during the caliphate of Uthman ra. Hafsa bint Umar ibn al-Khattab ra, one of the wives of the Prophet Muhammad pbuh also played a role in the compilation of the Quran, often safekeeping fragments as they were compiled to a whole, as committed by her father. Al-Azami acknowledged a few other Mushaf of the sahabah or companions, even dedicating a whole chapter of his book to the “So-Called Mushaf of Ibn Mas’ud”, concluding that there was not enough evidence to show that this Mushaf was any different from that of Uthman. As mentioned earlier, the order of the Surahs was indicated by the Prophet pbuh as the ayat were revealed. There are reports of the existence of the Mushaf of Ali ra, which is arranged according to the order of revelation which would be a historical record of the development of Islam. This was further corroborated by Arthur Jeffery in his “Materials for the History of the Text of the Quran” which lists 15 Primary and 13 Secondary Codices. There are two existing standards for a chronological reclassification of the Surah, firstly Noldeke and Schwally that is widely accepted by non-Muslim scholars, and the standard Egyptian chronology, which, according to Neal Robinson in the excellent “Discovering the Quran: A Contemporary Approach to a Veiled Text”, there is very little to choose from between them. In any case, the Mushaf Uthman is the standard accepted Quran of the Muslim World. As the Muslim civilisation developed further from its Arabian origins, the form of the Quran took on several additions. During the time of al-Hajjaj bin Yusuf ash-Thaqafi, the notorious governor of Iraq during the Umayyad Caliphate who ruled with an Iron Fist did contribute to the form of the Quran it exists today – the division of the Quran into seven manazil and 30 juz to aid its reading over a week or a month was ‘a practical outgrowth of his curiosity’. Over time, other reading aids appeared such as dots and diacritical marks (eg. fathah, kasrah and dhamma) especially in light of the Quran reaching non-Arabs. If a chronological compilation of the Quran would be very useful in seeing the unfolding of Islam from a historical and civilisational perspective, actually understanding the context in which the ayat was revealed would add even more weight to the nuances of the message. This was the idea of “Asbab Al Nuzul”, or “Reasons of Revelation of the Noble Quran / Occasions and Circumstances of Revelation” (two English translations of the same Arabic title by two different publishers). The most notable (and among the earliest) of these efforts was by Imam Ali Ibn Ahmad Al-Wahidi Al-Naisaburi who published occasions of about 570 ayat out of the 6253 ayat in the Quran. The ‘Asbab’ however is meant to be more exegetical than historical, as the Quran is revealed for all mankind and not just the people of a certain time in history. While this phenomenological approach of study certainly enriches one’s appreciation of the Quran and its meaning, as according to Muntasir Mir in “Coherence in the Quran” outlined that Asbab an-Nuzul was referred to by ibn Taymiyyah and Zarkashi as an exegetical principle transmitted by the Prophet’s pbuh Companions which helps establish context, it does not in itself lend a complete framework to the conceptual understanding of the Quran. The approach of viewing the Quran as a comprehensive whole has been happening for more than a thousand years. One of the earliest examples is al-Jahiz’s “The Composition of the Quran” in the ninth century CE. A century later, Abu Bakar al-Nisaiburi would ask “Why is this verse next to the other one?” and chided the Baghdad learned men of his time for not paying more attention to these questions. This brought a rise of “Partisans of Coherence” which includes major figures of exegesis such al al-Razi (d 1209), al-Qurtubi (d 1272), Nizam al-Din al-Nisaburi (d 1327) and al-Suyuti (d 1505). Even the Andalusian judge Abu Bakr ibn al-Arabi remarked that “The verses of the Quran are joined together in such a manner that they are like a single word, harmoniously associated, structurally even.” Lately, significant developments in looking at overall themes and general structure occurred in the twentieth century with Abd al-Hamid al-Farahi (d 1930) from India and Amin Ahsan Islahi (d 1997) from Pakistan, as well as Muhammad al-Tabataba’i (d 1981) from Iran and Sayyid Qutb (d 1966) from Egypt. Most recently current Quran scholars have deepened that knowledge such as Muntasir Mir, Muhammad Abdel Haleem, Neal Robinson, Michel Cuypers and Raymond Farrin. Cuypers has shown that symmetry in the Quran manifests in form of parallelism (AB/A’B’), chiasm (inverted parallelism – AB/B’A’) and concentrism. Nouman Ali Khan, a well-known Islamic speaker on the Quran, recently co-authored with Sharif Randhawa “Divine Speech: Exploring the Quran As Literature” which borrows heavily from Mir, Robinson and Farrin. 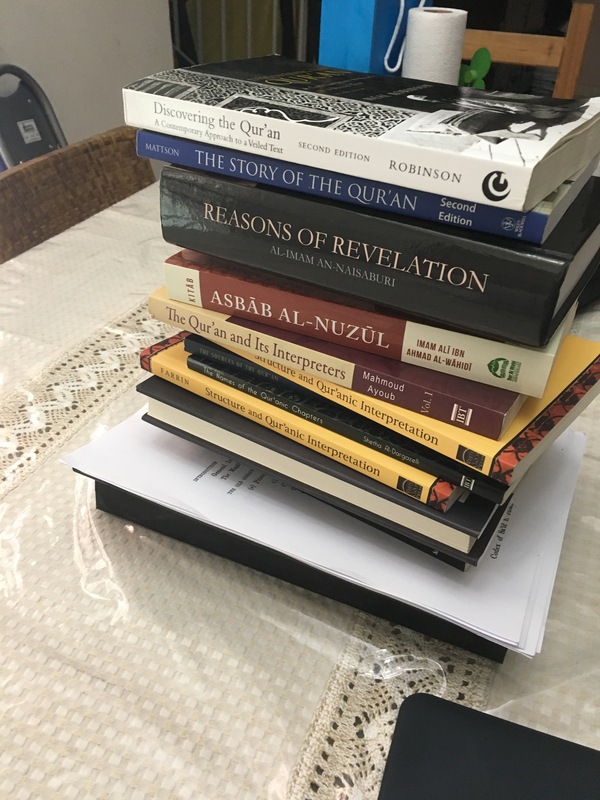 The efforts of Farahi, Islahi, Robinson and Farrin now becomes the focus of a Framework of the Conceptual Understanding of Quran; we shall start looking at the Ring Theory of Farrin which combines the aforementioned efforts into a structural coherence in the next post onwards. May Allah guide us to knowing His Book.